Body movement in kata - what does it mean? Embusen: a kata's movement "floorplan"
“Embusen” is a Japanese term that literally means “demonstration line(s)”. It is commonly used to describe the pattern of lines along which a kata is performed. So, for example, the kata pinan nidan / heian shodan has a sideways “H” embusen (meaning that when performed, the kata will, broadly speaking, trace an “H” - or if you prefer, a capital I with serifs - on the ground). The kata shisochin has both an “x” and a “+” embusen (ie. it moves in 4 directions from the centre - which fits well with its name, meaning “4 direction battle”). The variations on embusen are almost endless - particularly when one looks at other arts. The “embusen” of the internal art of xingyiquan is essentially a straight line forward and a straight line back. Baguazhang’s “embusen” comprises endless circles, like eddies in a pond or stream. I even know of one bak mei (white eyebrow) form where the “embusen” traces the Chinese character that is the name of the form. So traditional martial arts are often defined by the embusen of their forms. But what significance does embusen have for kata/forms? Embusen functions principally to maintain symmetry and allow for moves to be repeated (for the sake of practice). A well-designed pattern also allows for a fairly complex and lengthy sequence to be practised in a short space. So, for example, xingyi and xingyi-derived forms can require an inordinate amount of practise room because they follow a straight line “embusen”. Consider the form Da Peng Zhan Chi which is modeled on a xingyi platform: it requires the entire diagonal length of our dojo (about 12 m), and even then the movements require a little “shortening” to fit. Da peng zhan chi - a xingyi-related form of Hong Yi Xiang which has a linear "embusen"
Baguazhang has solved this particular issue by being practised in a circle. It is my view that this is the principal reason for the circular practice of bagua - not any particular application; the circle allows continuous stepping without the need for an enormous practice space. Indeed, bagua can be practised in a straight line if you so choose - consider the Gao style of Zhang Junfeng, for example. So embusen is pertinent to kata/forms for pedagogic reasons. But does it also have some function in relation to application? Arguably embusen plays no role at all in application. It is purely a pedagogic device. However it is important here to distinguish the overall pattern traced by the performer of a kata and the body movement, if any, employed in individual techniques (eg. whether a particular kata technique is performed with a step forward, backwards or sideways or during a turn). I shall call the latter “body movement” ("taisabaki" in Japanese). I could have called it "evasive movement" ("tenshin") since a substantial amount of kata movement is concerned with evading attacks, however it is often more about "intercepting" attacks rather than simply evading them - more on this later. While the overall pattern of your embusen has no significance to application (bunkai), the individual movements comprising the embusen were, in my view, chosen with care: in other words, they are relevant to the application of the particular techniques because they are part of what makes them applicable. If the body movement includes a turn, then some aspect of body turning (either with or without a step) will be involved. Again, as I shall expand upon in a moment, this needn’t involve a full turn as executed in the kata, but will usually involve a smaller movement. Most karate kata feature forward stepping. The same is true of karate’s southern Chinese counterparts. Even the northern shaolin schools and the internal arts of xingyi, bagua and taiji feature very little “retreating” movement. So how is a forward step to be interpreted? It is my view that “forward steps” comprise 2 types - movement in attack and movement in defence. The latter usually features both a defence and a counter-attack. A forward attack on its own is self-explanatory: you want to use your bodyweight when attacking, so this means either lunging or stepping forward. The forward defence is a little more complicated. Why would you defend by moving forwards? The answer lies in catching the attack early: by moving into your opponent you are trying to intercept the attack before it has reached its full speed. The earlier you can catch the attack, the slower its speed and the smaller the angle needed to deflect the attack. Some people call this approach “slowing down the attack”. Typically a forward defensive step is not straight into the attack, but off-line. 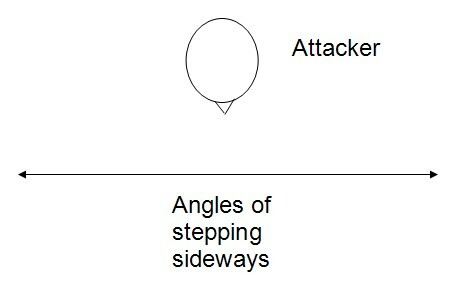 So where a kata features a forward step with a block, it is usually safe to assume that the step should be applied at an angle towards the front. I typically refer to such a step as “45° forward” because it is a generic descriptor of an off-line forward movement. But in reality the angle might be 10° or 15° or 30°, etc: you choose the finest angle that will permit you to deflect and evade the attack while putting you in a position to counter. The smaller the angle, the better your position for an immediate counter, but the greater the risk of your deflection/evasion failing. The advantages in “evading forwards” are obvious: it not only “slows down” the attack, it also places you within immediate range for a counter (where evading backwards might put you out of range, requiring you to move forward again to counter). Despite the fact that “forward evasion” is more advantageous, sometimes kata will feature a retreat instead. Why? Backward evasion might not confer the same advantages as forward movement, but it is a fact of life. As I discuss in my article “The flinch reflex” it is human nature to withdraw from danger. While we can train to modify our flinch reflex so that it propels us forward, a surprise attack can often put us (literally) “on the back foot”. In other words, the lateness of your own reaction might leave you with no option but to evade the attack by moving backward. Moving forward at such a point might simply put you directly into the “firing line”. There are 2 principal reasons why people suffer this kind of “late initiative”. Beginners typically haven’t grooved both a quick and productive reaction to an attack. However even very experienced fighters can be surprised; surprised in such a way that backward evasion is their only option. Moving away from an attack means that you give the attack the chance of reaching its full speed. But if the attack is pretty much at full speed at the moment you react to it you don’t exactly lose anything by moving away from it. In fact, you can use this to your advantage. 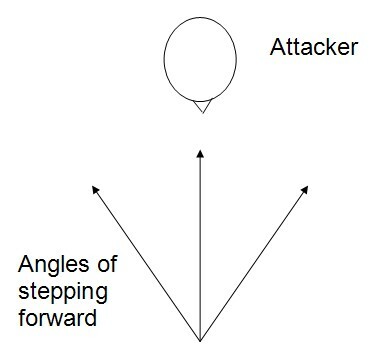 Because by allowing your attack to “speed up” you can “exhaust” its forward momentum - then counter when the attacker is “resetting” him or herself. Rarely is such an evasion effected straight back. 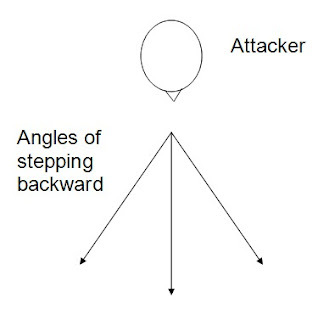 To do this will simply permit (or even encourage) the attacker to continue to attacking along the same line. Rather, as with the forward evasion, you should step off-line. Again, I typically refer to such a step as “45° back” because it is a generic descriptor of an offline backward movement. But in reality the angle might be 10° or 15° or 30°, etc: you choose the finest angle that will permit you to deflect and evade the attack while putting you in a position to counter. And again, the smaller the angle, the better your position for an immediate counter, but the greater the risk of your deflection/evasion failing. Backward steps are found in a number of kata. Predictably, kata designed as more “basic” teaching tools (for example gekisai dai ichi and ni) contain a higher proportion of backward body movement. I don’t believe this is an accident. To me it is quite clear that the gekisai forms were designed by Chojun Miyagi with beginners (and the beginner tendency to react very late in the piece - probably with a withdrawal “flinch reflex”) in mind. Chojun Miyagi and Shoshin Nagamine were respectively called upon to create practical beginner kata in the early 1940s, ostensibly/officially for teaching in schools and for the wider dissemination of the art (but in all probability, more as a reflection of Japan's increasing militarism during that era). As a result Nagamine created a kata he called fukyugata ichi (meaning “a kata to be spread or disseminated - No. 1”). This kata’s embusen is based heavily on the pinan floor pattern, ie. a sideways “H”. But more importantly than this, the body movement is also taken from the pinan series: namely the defender moves directly into the oncoming attack. This occurs right from the word go: The first movement is against an attack from the left. The defender steps with his left leg directly to the left, turns the hips and blocks the attack. When faced with his job of designing fukyugata ni (what is now gekisai dai ichi) Miyagi also had the defender responding to an attack from the left. However his approach to stepping was significantly different. Rather than have the defender move his left leg to the left, his kata has the defender moving the right leg forward. In practical terms this amounts to a “slightly back” off-line step. I believe this was no accident. Miyagi wanted to create a form that was usable by beginners. To expect beginners to have quick and appropriate “forward-biased” reflex reactions is to expect too much. In my view Miyagi wanted something more immediately applicable. Further to this train of thought, I observe that Miyagi also included a backward step into shiko with a gedan barai (a low sweeping block or strike). Again, I think this was no accident. When defending against attacks such as kicks (which are faster and heavier than arm attacks) beginners are prone to panic - and flinch away. Miyagi decided to harness this natural reaction and make the backward step the primary application. The step in gekisai is to be contrasted with the similar movement in seiunchin - where first step into shiko dachi is forward. Of course movement needn’t be forwards or backwards. It could be sideways. I won’t focus on this to any real extent because sideways evasion is, quite clearly, a hybrid of forward and backward evasion. It confers some advantages, but some disadvantages too. Like any other type of evasion, its use is determined by context. For example, when facing a very fast, penetrating attack, you might have very little time to move despite reacting early. In that case moving forward or back off-line might be insufficient to take you out of the firing line. Instead you might suddenly need to increase the amount of off-line movement by stepping directly to the side (an angled off-line movement being clearly a smaller off-line movement). Sideways movements in kata (such as the sideways step in cat stance in gekisai dai ni) are typically much larger than those needed in real civilian defence encounters, but that is the case with any kata technique in my experience: you practice larger movement because it is easier to correct and harder to perform. After all, if you can effect a big step quickly, a smaller step will inevitably be much easier to perform quickly. Indeed, sometimes there is no real “step” component to the body movement. In that case, the body turn or pivot is itself the principal body movement. Another quote attributed to Miyagi is: “a turn doesn't mean you are facing a new opponent.” This has been interpreted to mean that turns are really nothing more than a device to keep you within the boundaries of the embusen pattern; to permit the equal repetition of techniques within a confined area. There is a lot of merit to this thought, as I outlined at the start. But I believe there is more to turns than just this. How you turn holds important lessons because it often teaches you the kind of turning body movement to which I refer in this part of the article. Which leg does what in a turn is critical: you might never apply a body turn as a full turn-around (180° or 270°) but the exact same principle is applied to a smaller body turn - even something like 10°. In short, turns can be “slips”. I propose to deal with the subject of "slips" at length another time. So far, so good: but what if a kata has “no body movement”; ie. it features techniques that are executed while the performer is largely stationary? The first argument I encounter when I raise the issue of body movement is that some southern Chinese and Okinawan forms have very little. Some comprise only a couple of steps forward and back, or side-to-side, with a whole lot of technique being executed while the performer is stationary. Pan Shifu of Yong Chun baihe (white crane) demonstrating sanzhan. Note the (relative) lack of body movement, in particular the lack of stepping from 0:40 to 0:50. This low number of steps in the above performance of sanzhan seems to be at odds with the reality of combat. So why is this form practiced with so few steps? One answer to this is to be found in understanding the focus of the particular form: sanzhan is a foundational practice method that teaches such things as grounding. In order to have good grounding skills one must spend a lot of time practising “zhan zhuang” or “standing post” practice. Southern Chinese forms emphasize grounding much more than their northern counterparts which emphasize mobility, so it is hardly surprising to find that the latter feature forms with a great deal more stepping and body movement generally. A typical northern form from taizu changquan. Note the focus on mobility and in particular the side-to-side movement upon which I shall expand in a moment. A dynamic white crane form. Note the forward movement. So, assuming you have a form that is largely stationary, how, if at all, does one infer body movement from it? The kata will usually provide a clue. In the case of sanchin/sanzhan (and the southern Chinese systems generally), the forms might have few steps. But they do have steps nonetheless. And these steps are generally initially forward steps (followed by either a turn and more forward steps or, occasionally, backward steps). Either way, the forward steps come first. This suggests to me that the “stationary” techniques were primarily intended to be applied with forwards body movement. Second, the movements, while performed without stepping, might well involve weight transfer or body twisting of a kind that utilises a smaller, more subtle variation of stepping or turning body movement. But what if there is no meaningful stepping - either forward or back - and no other, more subtle, body movement either? The most obvious example given to me in this regard is the kata naihanchi/tekki (which we call "naifunchin" at the Academy of Traditional Fighting Arts). This kata moves with side-to-side cross steps, but none of these are readily interpreted as being some sort of body movement intended to augment the techniques themselves. Mostly the techniques are executed in a stationary kiba dachi (horse stance). What’s going on here? But the question remains, why doesn’t naihanchi feature some of this applied taisabaki? On one view it would be limiting. Because once you execute a technique with a particular body movement (eg. a step forwards) this becomes your focus - often to the exclusion of another movement (eg. a body turn). Could it be that a kata as fundamental as naihanchi (or sanchin) was designed not to be so “limiting”? I think so. Southern Chinese quan fa is, in particular, very reticent about body movement for this reason and the other reasons I’ve discussed before (eg. grounding). The more fundamental the kata, the more the steps are reduced or abbreviated. Some have argued that naihanchi is of northern origins and that such considerations do not apply. Indeed, when you consider the northern taizu changquan video I have embedded above, there is some superficial resemblance. Both forms move side-to-side and use horse stance. The main difference is, of course, that the “sideways” movement in the taizu form turns the whole body - so although you are moving side-to-side relative to someone watching from the front, you’re actually moving forwards and backwards along that line. I think this is a fascinating topic that deserves more attention another time. Suffice it to say that even if naihanchi began life as a northern form, it has long abandoned its origins and subscribed to the southern paradigm of grounding and less movement. It is certainly used in this context by shorin-based karate practitioners. Embusen of a kata is indeed primarily about facilitating your performance of certain techniques within a defined area. It also assists in enabling such things as technique repetition for practise. But the nature of the body movement in each technique, including the steps and turns, is not just a by-product of the embusen “floor pattern”. Every such movement must have some meaning, otherwise kata is pointless. In other words, the body movement in kata must match the technique - it must be appropriate to it and complement it. It must make the technique work. In this regard it should be clear that it is impossible to separate a hand or foot technique from taisabaki (the movement of the body): the 2 are inextricably linked. They can be separated in analysis - which might lead to "oyo" (extrapolations or variations of kata techniques) - but fundamentally they are equal parts of the same application. So in order to understand the bunkai (applications) of your kata, don’t ignore the context in which they occur in kata. It’s all very well not to be “fooled by the rule of embusen” but it is quite another to be fooled by the assumption that the body movement comprising embusen is irrelevant to kata application. I think it is quite reverse. The taisabaki shown, hinted at or accommodated in the embusen provides the key to understanding kata applications in a dynamic environment. Interesting post. Hung Gar Kuen has a form that follows the shape of a Chinese character that resembles 'I'. Here's an example from a rather cheesy seventies kung fu movie. Great article as always, but I was thrown by your statement about Bagua's circling being to save space. I've heard/read several times that the circling is essential to teach the footwork necessary for bagua's two skills of getting behind an opponent and weaving through a crowd of multiple attackers. I have to admit I've never studied linear bagua, but can you really get the same skills/practise from a straight-line form? "Saving space" is just one aspect of circle walking in bagua. Another is that it leads into what I will shortly detail as "spiralling momentum". But the circle walking is not strictly necessary for that. When you think about it any "straight step" can be "off line", creating or starting an evasion. You don't need to make multiple "lead up" steps in literal circles in order to deploy turns or spiralling momentum at the critical point. In bagua, the important part occurs at what is called the "change" - ie. the point of interception of an attack. In the standard bagua "palm changes" sequence this occurs after the eighth step or so. Up to that "change", the circle walking helps you bed down the principle of spiralling momentum (by getting in the right frame of mind, if nothing else) but it isn't necessary in my opinion. 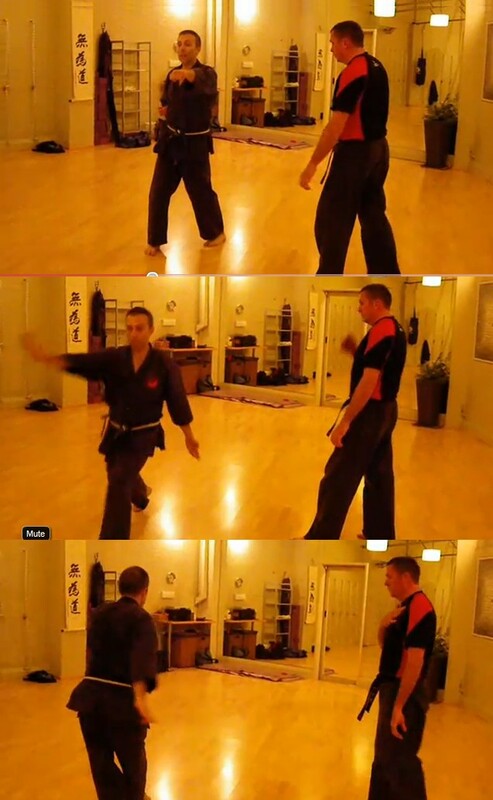 If you look at Gao style linear bagua for example, you'll see the same techniques being demonstrated along linear paths, much like xingyi. Thanks again for reading and for your comments.